The Grand Ducal Standard is the official flag of the sovereign. The Grand Duke is the head of state, symbol of its unity, and guarantor of national independence. He exercises executive power in accordance with the constitution and the laws of the country. 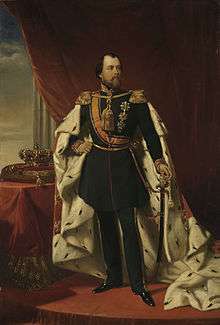 After a constitutional change (to article 34) in December 2008 resulting from Henri's refusal to sign a law legalizing euthanasia, laws now take effect without the grand duke's assent. As a result, the grand duke no longer has any formal role in the legislative process, but his task of promulgating the law as chief executive remains. Succession to the throne was governed by Salic law, as dictated by the Nassau Family Pact, first adopted on 30 June 1783. 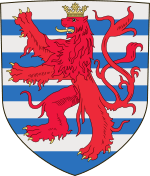 The right to reign over Luxembourg was until June 2011 passed by agnatic-cognatic primogeniture within the House of Nassau, as stipulated under the 1815 Final Act of the Congress of Vienna and as confirmed by the 1867 Treaty of London. The Nassau Family Pact itself can be amended by the usual legislative process, having been so on 10 July 1907 to exclude the Count of Merenberg branch of the House, which was descended from a morganatic marriage. An heir apparent may be granted the style 'Hereditary Grand Duke'. The current heir apparent is Hereditary Grand Duke Guillaume. 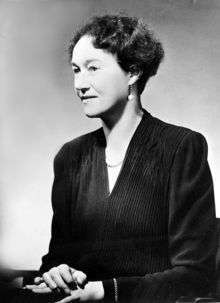 In June 2011, agnatic primogeniture was dropped in favour of absolute primogeniture, allowing any legitimate female descendants within the House of Nassau to be included in the line of succession. The current grand duke, Henri, bears the full style: By the Grace of God, Grand Duke of Luxembourg, Duke of Nassau, Count Palatine of the Rhine, Count of Sayn, Königstein, Katzenelnbogen and Diez, Burgrave of Hammerstein, Lord of Mahlberg, Wiesbaden, Idstein, Merenberg, Limburg and Eppstein. It should, however, be noted that many of the titles are held without regard to the strict rules of Salic inheritance. Under the 1783 Nassau Family Pact, those territories of the Nassau family in the Holy Roman Empire at the time of the pact (Luxembourg and Nassau) were bound by semi-Salic law, which allowed inheritance by females or through the female line only upon extinction of male members of the dynasty. When William III died leaving only his daughter Wilhelmina as an heir, the crown of the Netherlands, not being bound by the family pact, passed to Wilhelmina. However, the crown of Luxembourg passed to a male of another branch of the House of Nassau: Adolphe, the dispossessed Duke of Nassau and head of the branch of Nassau-Weilburg. In 1905, Grand Duke Adolphe's younger half-brother, Prince Nikolaus Wilhelm of Nassau, died, having left a son Georg Nikolaus, Count von Merenberg who was, however, the product of a morganatic marriage, and therefore not legally a member of the House of Nassau. 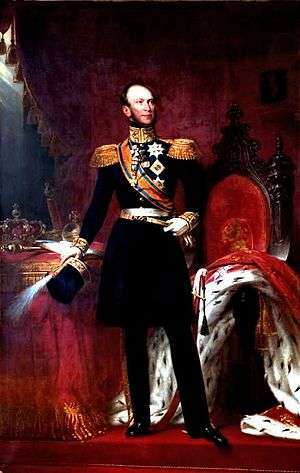 In 1907, Adolphe's only son, William IV, Grand Duke of Luxembourg, obtained passage of a law confirming the right of his eldest daughter, Marie-Adélaïde, to succeed to the throne in virtue of the absence of any remaining dynastic males of the House of Nassau, as originally stipulated in the Nassau Family Pact. 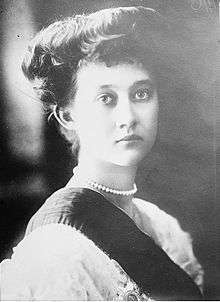 She became the grand duchy's first reigning female monarch upon her father's death in 1912, and upon her own abdication in 1919, was succeeded by her younger sister Charlotte, who married Felix of Bourbon-Parma, a prince of the former Duchy of Parma. 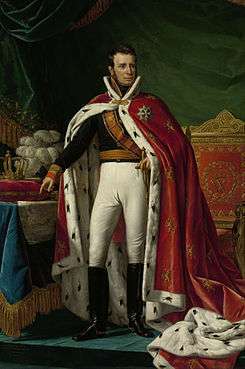 Charlotte's descendants have since reigned as the continued dynasty of Nassau, and also constitute a cadet branch of the House of Bourbon-Parma. 1 2 3 "Constitution de Luxembourg" (PDF) (in French). Service central de législation. Retrieved 2016-04-03. ↑ "Luxembourg strips monarch of legislative role". The Guardian. London. 12 December 2008. Retrieved 4 May 2010. ↑ (French)/(German) "Mémorial A, 1907, No. 37" (PDF). Service central de législation. Retrieved 2008-01-14. 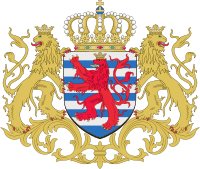 ↑ "New Ducal succession rights for Grand Duchy". Luxemburger Wort. 21 June 2011. Retrieved 11 July 2011. "Constitution de Luxembourg" (PDF) (in French). Service central de législation. Retrieved 2008-01-14.